Not just another day at the lab. 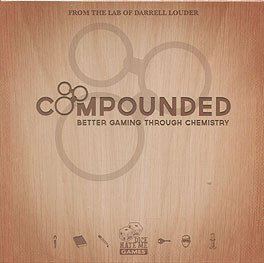 In Compounded, players take on the roles of lab managers, competing to complete the most compounds with carefully-managed elements before they are finished by others - or destroyed in a lab explosion. There's a fair share of press-your-luck tension and strategic planning, but the most successful scientists will often strike a good trade with their fellow lab mates. Players may freely trade elements, lab tools and even favours - if there is truly honour among chemists!